And that leads to another point: A “welfare state” is not socialist–or more precisely, not necessarily socialist. A broad range of tax-supported government benefits is not inconsistent with a capitalist economy. In fact, almost all developed nations with capitalist economies have “welfare state” policies to one extent or another. But are these still socialist ideas? Again, not necessarily, unless you consider public education to be a socialist idea. Or unemployment insurance. Or Medicare. Or social security. Of course, some conservatives do. But most realize that these are policies developed by liberals to modify the inegalitarian effects of capitalism. Actually, maybe I’m giving liberals too much historical credit. It was autocrat Otto von Bismarck who introduced old age pensions, accident insurance, medical care and unemployment insurance in Germany in the 1880s to steal the thunder from a growing socialist movement. And with that, on we go…liberalism isn’t socialism, Tea Party obsessions notwithstanding. Liberals believe in capitalism, and want to preserve it. They just want to make it “fairer”–that is, less painful to the losers in the economic competition; capitalism with a smiley face. Hence, the welfare state. So Barack Obama, again contrary to Tea Party invective, is not a socialist. He’s just a plain old liberal, and a not very consistent or effective one at that. Finally, economic equality and the redistribution of wealth isn’t socialism. Just ask Karl Marx. I’m going to avoid quotes from the sacred texts, so you’ll have to Google that yourself. So…all the things that make conservatives scream “socialism” are hardly the essence of that philosophy. Now I can move on to struggling with what it actually is…or might be. 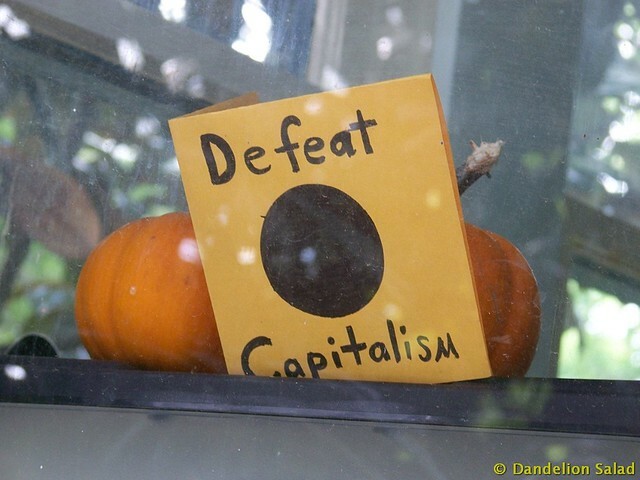 This entry was posted in All Posts News Politics and-or Videos, Capitalism, Dandelion Salad Guest Writers, Economy, Politics, Socialism and tagged Capitalism on Dandelion Salad, Engel-Michael, Liberalism, Michael Engel. Bookmark the permalink. I am not sure you’ve clearly defined “socialist’ here before saying what’s NOT socialist. I don’t think that was the intent of this short article. nadia , i think that the writers intent may be to just say what it is ”Not ” .. and leave it at that, since the word has really become a red herring and just thrown around these days . but yes , i would be interested in his view of what he thinks it is . So would I Rocket! Lo you’re going to want me to keep it succinct and then maybe go away and be quiet for a while; but as this is no trivial matter, surely it’s time to really try to say what we mean ~ since words begin to assume eponymous dimensions and then, all too quickly we forget what it is they are supposed to refer to. I’d say the best place to start might be Noam Chomsky’s heroic historical narrative. Once we’ve got some idea of what has really transpired in our multi-polar world, then at least we can begin to agree about what we’re analyzing or drawing inferences from. I also think it is extremely necessary to come to grips with the paranoid psychology of the US. My own view is that guilt and paranoia are endemic for two reasons. The first is the almost indisputable fact that the USA exists because of genocide, so First Nations’ Nemesis is always present, and reinforces that Puritan angst about Nature ~ wild, threatening, untamed and probably feminine. The other diabolical aspect is the raw and undeniable contradictory emphasis on instilling the fear of God into people and alerting them to the temptations of the Devil, whilst profiting mightily from the allure of sin. Now we all know the Vatican needs the Devil, but the Protestant obsession with sanitized respectability contributes mightily to the otherwise inexplicable power of such toxic agencies of control like Monsanto, or the American Psychiatric Association. So the religious and fundamentalist tendencies have to be faced, and squared off. If that is what socialism implies these days, then sign me up! PS there is a banned TED talk by Nick Hanauer that might be worth mentioning. He is a rich man who says the rich do not create employment, but taxing them will, because that money can subsidize the small businesses that people really need. Common sense? Thanks, David for your commentary as always. Please don’t go away. Do appreciate your comments on the various posts here. David , a fundamentalist is a fundamentalist. America trades in obsessions . The Atheists i know are very very intelligent , but they used to be the same way when they were religious . They just traded one obsession in for another. The are stuck in this hyper-rationalism , prove this , disprove that nonsense. of course they laugh when i tell them that , but it is true . the thing is is that there is no fundamentalist tendencies . Everyone , unless they have been liberated in one way or another in this country are fundamentalists. re-wind : i will build my case that every human being as Cioran said is born with ”unconscious dogmas” . that is why Diogenes the Cynic was holding up his lantern looking for the ”disinterested man ”. so , really this is a global problem . a historical problem . a human problem . Great thoughts, What is unconscious dogma? Am I being lazy, do I need to read Cioran? David , you have to read Cioran ! his masterpiece is ”A short history of decay ”. he has a whole chapter on unconscious dogmas . i would not do it justice if i tried to explain it . you have to read it , within the context of the whole book . http://rogueembryo.com/2010/11/23/emil-cioran-unconscious-dogmas/ Cioran on unconscious dogmas .